Map of New Hampshire & Vermont. 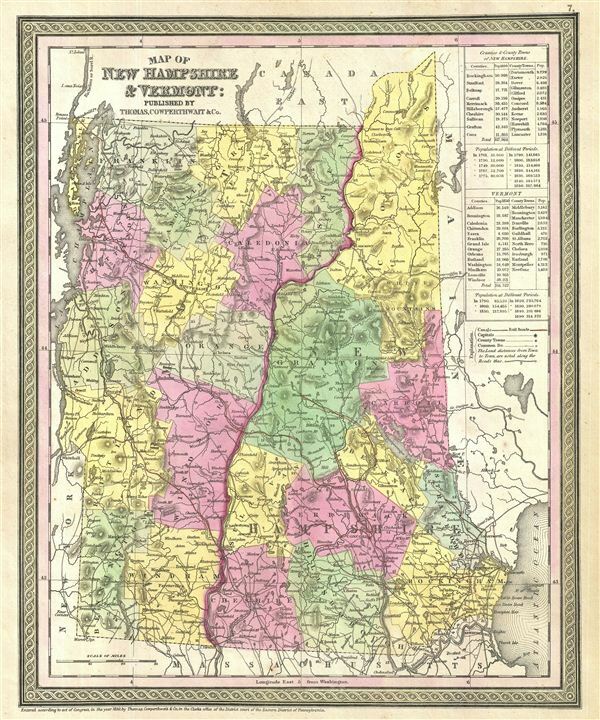 This is an attractive example of S. A. Mitchell's 1854 map of New Hampshire and Vermont. Centered on the Connecticut River, which forms the border between New Hampshire and Vermont, this map covers both states as well as adjacent parts of Massachusetts, Maine, New York and Canada.. In the upper right quadrant, four inset tables describe separately New Hampshire's and Vermont's counties and towns as well as their population at different periods. The whole is engraved and colored in Mitchell's distinctive style with green border work and vivid pastels. Political and topographical features are noted and color coded with elevation rendered by hachure. Rumsey 5363.008 (1846 edition). Phillips (Atlases) 814.